Did they have Lonely Planet guides in the thirteenth century? I bought this book from Daunt Books, a lovely bookshop on Marylebone High Street in London. I was on a mission to find the Rococo Chocolates store. We had their chocolates as party favours at our wedding. We ordered them online and we never had the chance to go to a shop as, best to my knowledge, they don’t have a store in Manchester. 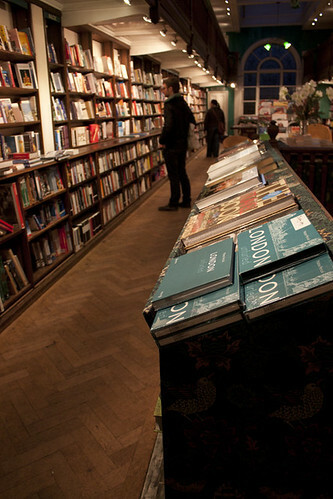 After we satisfied our curiosity and found the shop, we walked around Marylebone High Street and ended up in the bookshop. How can I not buy a book from a place that looks like this? I found two Penguins that made their way back home with us. The book is written in the thirteenth century and depicts the court of Kubilai Khan, the Mongol leader as experienced and witnessed by Marco Polo. The read kept pushing me into this wonder of how much time has passed and how many generations all those places have seen since. My original post was a lot more naive considering I assumed the book was a relatively faithful recount of the times. Before I published it to the blog I ‘bumped’ into a few references doubting it’s accuracy or going further and claiming Marco Polo never made it to China. As a parenthesis: I found one of these references in the ‘Food Myths’ article by Tom Parker Bowles in the quarterly food magazine Fire & Knives. Chris got them as a Christmas present a while back and I am finally reading them. They are great fun and I am now in search of the set for 2011. Grrr it is sold out in their shop but I am hoping for some renewed availability. Regardless of its accuracy, it still describes a very complex court with well-developed systems for trading, army even the postal service. I pictured that most of the written communication from that time would be quite prudish when it came to women. I am not sure why I was so mislead as there is quite a bit of information regarding women and their roles. Virgin daughters considered it to be a blessing to be chosen for/by the great Kubilai Khan while their fathers saw it as an honour and a blessed fulfilment of their lives. Prostitutes were conveniently found in the suburbs, available for travelling men. I sensed a subtle sense of appreciation for a community where it was an honour for a woman to be ‘experienced’. A bit like the thirteenth century version of an open marriage where the husband was embracing his wife showing a good time to a travelling man. Not only that but giving them the necessary privacy. Lesson learned: travel writing is a duty for the future. Hence I have to travel for posterity. It is not for my pleasure, it is just a selfless act I have to complete. I am just being selfless and obsequious. ( I learned a new word and challenged myself to use it in a sentence.. fun times … fun times). This entry was posted in Book Diary, Mon Atelier and tagged Daunt Books, fire and knives, Marco Polo, Rococo Chocolates, Travels in the Land of Kubilai Khan. Bookmark the permalink.